Mild parabolic 4' X 7" X 14 3/8" X 13 7/8" pod. Full length 3/8" deep concave. Made from 2 1' X 8" cedar boards. Just straight passes down the center w/ 7" grinding pad and 3" grinding pad. Blended w/ 7" sanding pad. Pretty much 100% shaped w/ grinder/sander and a bit of hand block sand paper. Parabolic looks bigger in third photo due to foreshortening. Total weight after 3 coats Helmsman Spar Urethane is 5 lbs. Will add a bit when I put on the deck traction. I've never tried a varnish finish. How necessary is the deck traction? I dont' know! 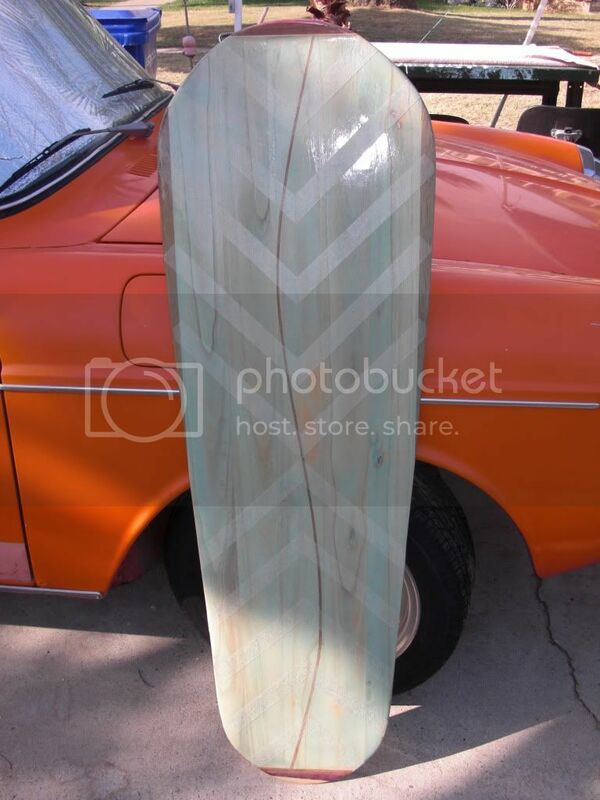 I never have either but Mike varnishes and puts traction pad or some such on all his boards so I just sort of figured. Not necessarily the short path to "reality" but there ya are. Old story about the guy who asked his mother why she always cut the end couple inches off a roast before putting it in the pan to cook. Her answer was that she did it because her mother always did it so she was sure it was important. So he asked "grandma" and you guessed it, same answer from her. Fortunately great grandma was alive to tell him the reason she did it... Her biggest roasting pan was always a bit too small. My approach would be see if you can do without it. If not, then add it. I'd find out how it floats before I added extra weight. Go granny. 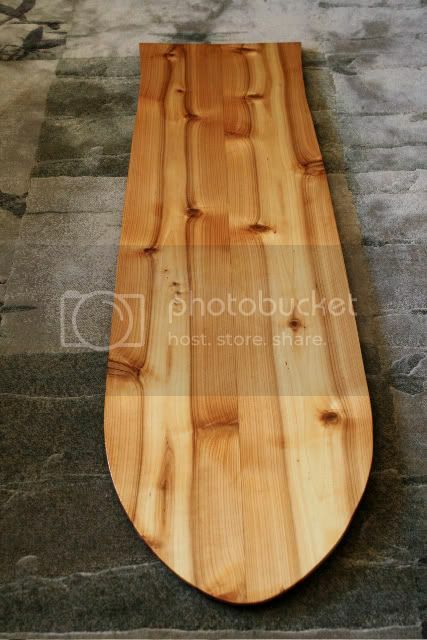 I've had plywood boards and imagine this will be comparable? I live so far from the ocean that every go-out counts big time and it is many many months between so likely I will do some sort of bath tub test for traction and maybe even flotation. Takes me about 8+ hours at 90 mph (literally) to get to the beach. Have to rent motel room, spend a day or 2 or three. Not much of a way to do modifications and tests that way. Good idea! Mike, you alway put traction on yes? 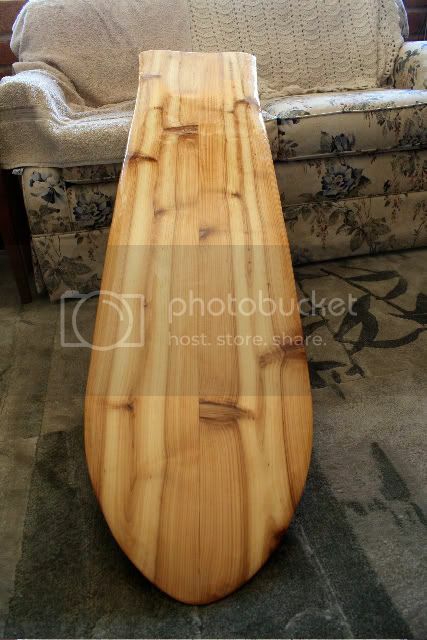 Have you tried riding varnished wood w/ nothing added? I like lots of "grip" when I am on a wave, no shifting position unless I do it on purpose. I used Minwax Polyurethane on all my wood rides and never added anything for traction, including on my traditional paipo and mini paipos. I never felt I needed it while in the water either. But those were of a different size and shape from the boards you guys are riding...that said, I think I'd do like Mike and Bob suggest and wax a bit where you think you might need traction and carry a bit of wax to fill in on spots where you may find it helpful. When I was first starting to surf my local shop (Morey-Pope) was still offering a product called I think "Slip Check", some kind of spray-on traction. The word was it was like spray-on sandpaper - hard on bodies. As wetsuits were just past infancy I would imagine there was an issue there too. The product faded but the lesson remained. Tom Morey is affiliated in some way with a replacement product called "El Grippo" of which I have heard nothing. Morey is also the guy who wrote a Surfer Tip about using clear silicone seal to repair dings...I have thought about using a bit of that thinly spread as a soft, removeable traction aid in key areas if necessary. Modern traction pads leave me cold as I generally don't fly off waves and the sad nature of seeing a surfboard on Craigslist covered with them makes me cringe in embarassment. But I do tihnk of them when I see long skinny prone boards.